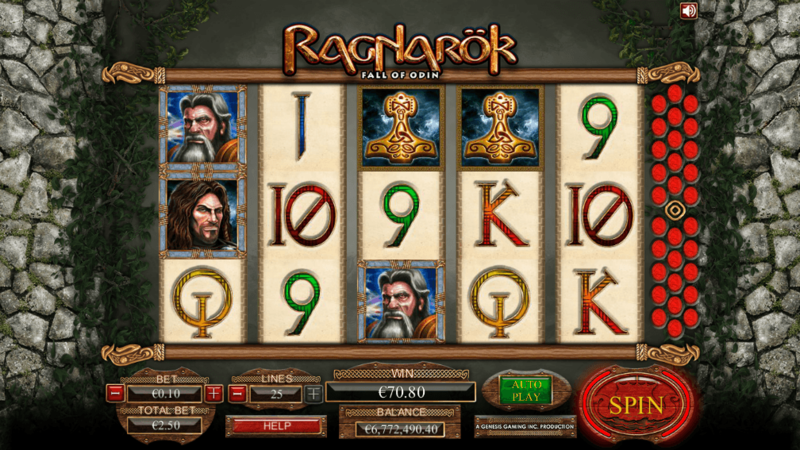 Ragnarok: Fall of Odin slot is a title from Genesis Gaming and presents a mythical theme we have seen several times before. The game has 5 reels over 3 rows and has a total of 25 paylines, which is very typical for this slot game maker. The game includes three bonus feature, all of which are triggered when you land 3 or more ‘Tree of Life’ scatter symbols in any poosition on the reels. Over the first 15 times you activate the bonus feature you will get the Thor bonus feature. This will rewards you with 10 free spins with a 2x multiplier on all wins. The following 15 times you activate the bonus feature you get to choose between the Thor and Freya bonus features. If you decide to go with the Freya feature then you will be take a visit to the Fire Giant for a chance to win cash prizes with some big multipliers. After the 30th time you activate the bonus feature you will get a chance to take on the Odin bonus feature, as well as being offered the other two bonus features. In this feature you will get 8 free spins with the Ruin symbol added to the reels. Each time the Ruin symbol appears you will be rewarded cash prizes. 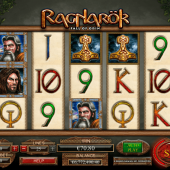 Ragnarok – Fall of Odin slot has a good selection of bonus features, with more opening up the longer you play. This game offers plenty of amusement, but there are better games of this theme, such as Thunderstruck and Thunderstruck 2.